The common gerber daisy, such a wonderful and bright flower. 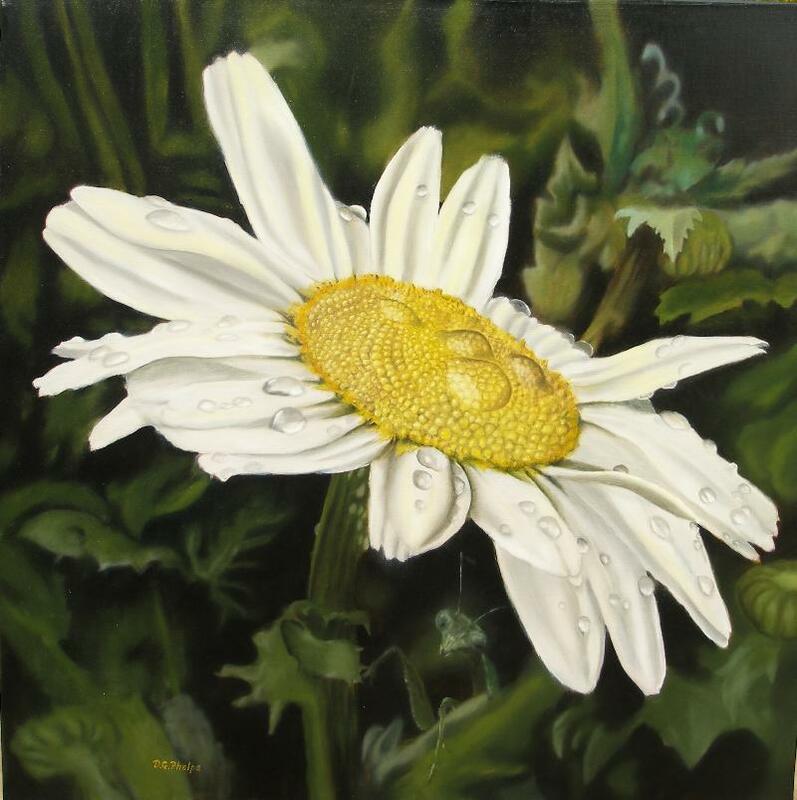 This particular painting is one of 2 daisy paintings created from this one blossom. The other is featured within my eBook to show an example of how to create these water droplets all over the blossom. I also use it to discuss hard and soft edges, and how to blend paint on a large area of the canvas. We had just had a big storm move through our area, when I decided to catch a few photo's within the garden to capture the rain drops that were still all over the blossoms. Hopefully you noticed my little buddy under the plant. She didn't think I could see her under there, but the camera sees it all. Our Daisy (common) is of the normal bright white that catches so much of the sunshine against its dark green leaves. This is a 30" x 30" gallery wrapped on canvas oil painting. 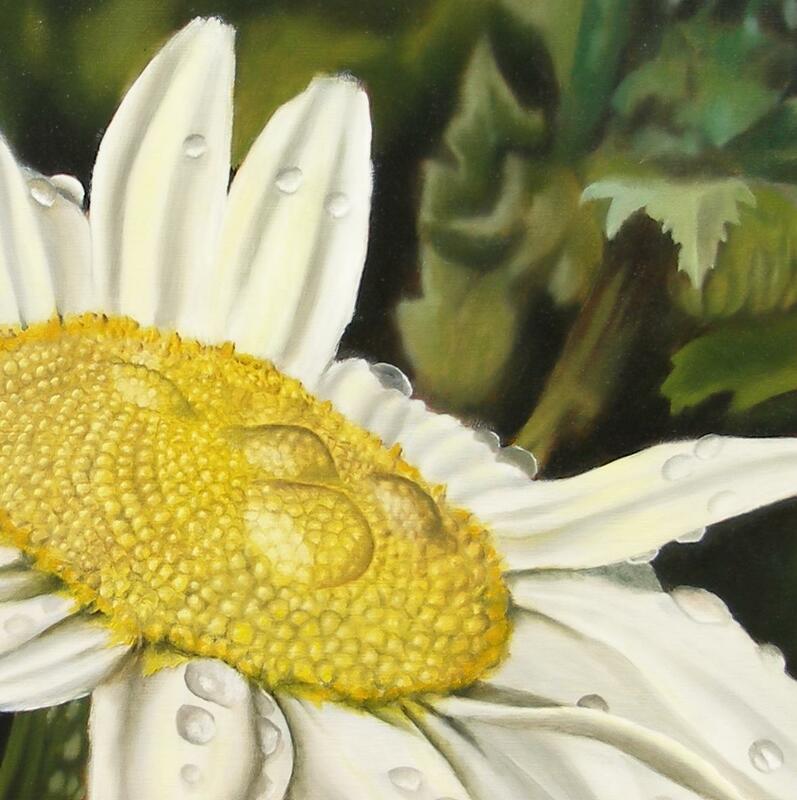 One of the things I love about painting a daisy such as this, the petals aren't truly white. They are quite velvety and capture so much of their surrounding colors. In this example there is an incredible amount of yellow and yellow-orange from the sunshine coming down. 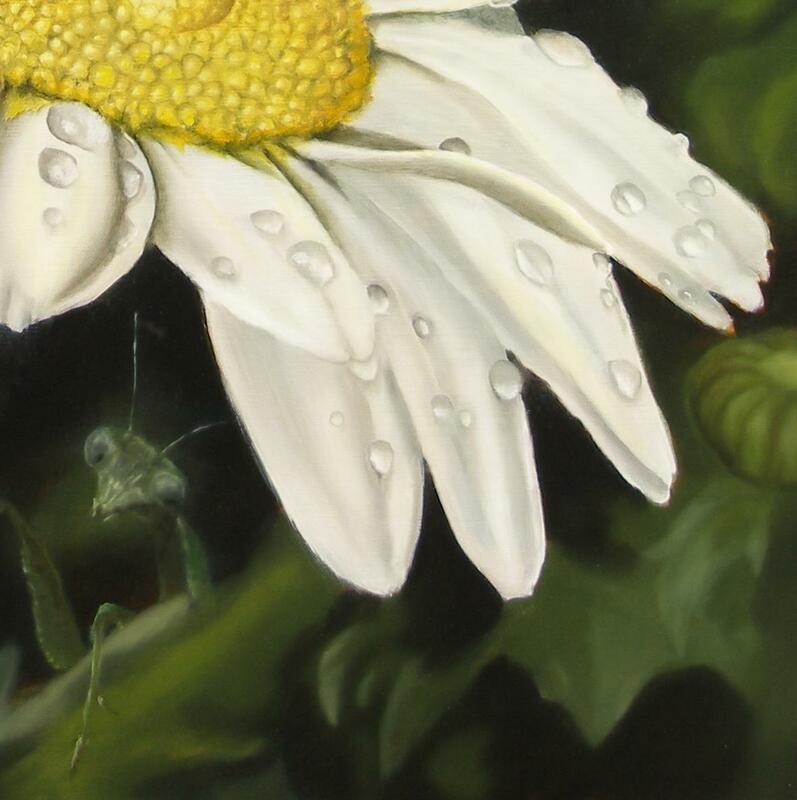 Each dew drop also captures surrounding colors and shadows. The other inspiring, well, hypnotic thing I find in these flowers are the central mass. I had to look this up to see how it is referred by. The outside set of petals are called "the ray", and the central mass of tubular yellow florets is called a "disc". Some would call this a "poached egg" daisy. Did you know they are part of the chrysanthemums family of flowers? Anyway, that central mass of florets has a very specific design and pattern, and to capture that was so much fun. Don't stare at it too long, or it will appear to move and circle around on you. Yep, it's a trick your mind plays when you view certain patterns for a long period of time. Especially when the image is large and takes up most of your field of vision. This particular painting has sold, but please check to see if I have a new similar painting available! Click here to head back to the main online art gallery. My Etsy Store of original oil paintings. Click here to go to the top of our gerber daisy page.